This third volume of the Middle Way Philosophy series applies the revolutionary view, taken from cognitive science, that meaning is found in our bodies rather than in a relationship between language and reality. The cognitive meaning found in dictionaries and the emotive ‘meaning of life’ cannot be separated. This approach reveals the basic error of the metaphysical views that depend on absolute cognitive meaning. 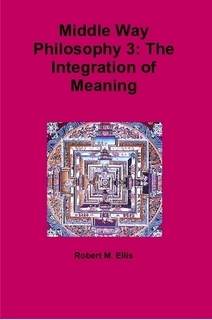 It also provides the basis for an account of how we can integrate meaning. Each new time we connect an experience to a symbol we extend meaning in a way that gives us more resources to develop more adequate beliefs. The practice of integrating meaning can be promoted by the arts, meditation and focusing, and can also involve working to resolve archetypes. Available in paperback, and in ebook form as part of the Omnibus Edition.